Coen Oosterbroek and Roel Groll consider some approaches for helping students develop higher order thinking in financial analysis. Based on our own teaching experiences, learners studying business in secondary education find topics such as liquidity and debt servicing ability difficult concepts to master. As a consequence, learners may end up at lower-order levels of thinking during these lessons, for example, by being able to calculate a current ratio or a debt ratio confidently, but to do little more than this. We suggest that there may be ways to achieve higher-order levels of thinking and helping secondary school learners to extend their transfer-ability with regard to financial analyses. This article aims at describing some possibilities for helping learners to transfer their knowledge of financial analyses across contexts and to automate basic calculations in an analytical and active way. In fact, learners who are provided with such a formula may reason as follows: “I’m studying the concept of liquidity, the current ratio is linked to this concept, and can be calculated as follows: current assets divided by current liabilities”. Next, the learners calculate the outcome based on a balance sheet with which they were provided. This approach, however, does not guarantee that a particular learner is able to solve problems in contexts that are presented slightly differently or situations that occur in real life. Following Eiriksdottir and Catrambone (2011) the use of general step descriptions may be helpful here. A question that involves such a general instruction when analysing a financial context could be: “what data should be compared in order to assess whether or not a firm has enough resources to meet its short-term obligations?”. When applied to the previous case, learners are likely to enter a process of identifying which information is needed to solve the problem. Secondly, from this general question they start addressing more specific aspects, for example by analysing: “what are in fact my short-term obligations”, or: “where do I find cash resources in the short term”? Logically, a next step would be to calculate figures that represent these concepts. Learners are likely to compare whether or not the assets meet the liabilities. In fact, it is highly probable that they will calculate the net working capital even without knowing any formula at all. In order to elaborate this first financial analysis, teachers can guide learners from the net working capital figure into a more relative figure such as the current ratio. Calculating the current ratio has the benefit of supporting comparisons between companies and requires a specific step description. When aiming at transferring this newly gained knowledge in yet another new situation, the teacher can provide the learners with a case (see attachment 1 for the story) and again a general question: “what data should be compared in order to assess whether or not a person has enough resources to meet their short-term obligations?”. This case is dissimilar to the learning context as it considers a private person instead of a business situation and as the information is framed in a story rather than presented in the form of a balance sheet. What are learners going to do now? It is likely that after reading the general question and story, learners will enter a process of identifying which information is needed to solve the problem. Secondly, from this generally phrased question they start analysing “what are in fact her short-term obligations”, or: “where does she find cash resources at short notice”? Logically, a next step would be to calculate figures that represent these concepts. Learners are likely to compare whether or not the available resources meet the obligations presented in the story. In fact, it is highly probable that learners will calculate Jane’s net working capital and/or may calculate her current ratio. This allows learners to come up with an answer to the central question – and help out Jane! The general step descriptions are helpful here, as specific concepts such as current assets or current liabilities may appear not to be present at the learners’ first sight, and have to be derived from the case. In our experience learners find this general step instruction useful when decoding a specific case that is new to them. Of course, teaching/learning goals may aim not only at transferring procedural knowledge of calculating ratios across contexts, but may also aim at applying and automating this knowledge. To do so, learners can be provided with exercises from a textbook. However, a different approach may be found by using a concept wheel, an active teaching/learning method. 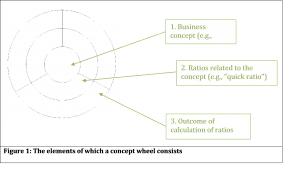 Learners are provided with a balance sheet and two printed and cut out concept wheels which consist of three levels, namely business concepts, ratios, and outcomes of calculations. See Figure 1 below. Learners receive an envelope with 14 pieces of the concept wheels in total, as well as a balance sheet (see attachment 2 for the full set of materials). The objective of this active teaching/learning method for learners is to create two correct concept wheels. Firstly, learners have to individually identify the ratios related to liquidity and the ratios related to debt servicing ability, which are at the first inner circle of the concept wheel at level 2. Secondly, they have to calculate the various ratios, which is at level 3. Thirdly, learners can compare their individually constructed concept wheels in pairs and discuss differences and similarities. This is an evaluative assignment that can only be used after learners have been taught about financial analysis. The plenary debriefing of this activity can be directed towards the process of constructing knowledge and towards the outcomes. The process of constructing knowledge can be made visible by asking questions, such as: “how did you solve this problem?” or: “what was your strategy?”. When discussing the outcomes, the objective is to identify which ratios (level 2) are grouped around each key concept (level 1). Also, which ratios (level 2) are related to which outcomes of calculations (level 3)? What are the steps that learners took to resolve this problem? How did they construct their knowledge? Interestingly, one of the outcomes the learners are provided with is incorrect, and one of the ratios has to be filled out by the learners themselves. During the debriefing of the activity, it is important to address both aspects, as they will highlight learners’ deeper understanding of the financial analyses and encourage learners to discuss their findings in depth. By providing exercises that support transfer of learning and automating procedures in an active way, we aim not only at learners being able to calculate a current ratio or a debt ratio but to support them in gaining a deeper understanding of the meaning of financial analyses. We encourage teachers in secondary education to experiment with these active approaches and are curious to hear about your own experiences when using these materials. We would love to provide extra information if questions pop up, hence please feel free to contact us via: roel.grol@han.nl / coen.oosterbroek@han.nl. Eiriksdottir, E., & Catrambone, R. (2011). Procedural instructions, principles, and explanations: How to structure instructions for procedural tasks to enhance performance, learning, and transfer. Human Factors, 53, 749-770. Gick, M., & Holyoak, K. (1983). Schema induction and analogical transfer. Cognitive Psychology, 15, 1-38. Holyoak, K., & Koh, K. (1987). Surface and structural similarity in analogical transfer. Memory & Cognition, 15(4), 332-340.